No Limits is an interdisciplinary student conference on Women's and Gender Studies sponsored by the Women's and Gender Studies Programs at UNO, UNK and UNL. The conference began in 1993 with a group of dedicated students who wanted to create an unquestionably interdisciplinary conference able to accommodate both traditional and non-traditional topics and presentations. Since that time the conference has remained student-oriented, open to undergraduate and graduate students, as well as recent graduates. 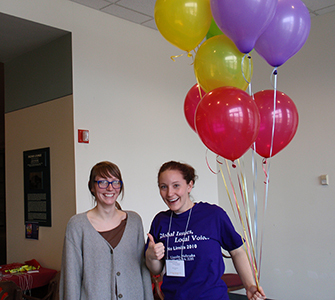 In the past twenty years, No Limits has hosted hundreds of presentations from students and community members involved in Women's and Gender Studies in numerous academic departments and community groups. Further, No Limits encourages creative presentations, including artwork, performances, and the reading of original work. No Limits has also hosted many renowned scholars, writers, performers and activists, including Meenakshi Gigi Durham, Obioma Nnaemeka, tatiana de la tierra, Judith Cofer Ortiz, Nomy Lamm, Toi Derricotte, and Lourdes Portillo. In order to keep this event accessible to all participants, No Limits charges no conference registration fee. It is entirely supported by donations from academic departments and units within the University of Nebraska and the fundraising efforts of student organizations. Being the Future, Riding the Next Feminist Wave: No Limits 2019 will be held on Friday, March 8, at the University of Nebraska-Lincoln featuring Shireen Ghorbani as this year's keynote speaker. A former University of Nebraska graduate student, Ghorbani received her MA in Communication Studies while specializing in WGS. She is currently running for Congress in Utah's 2nd District. Stay posted for the call for papers.